Extended Holdover Crystal Oscillator (EHXO) Targets Critical Base Station Timing Requirements. The SKY13264-340LF is a 4-input to 2-output switch in a low cost QFN-20 4 x 4 mm package. The SKY13264-340LF enables 16 states, directing any of the four inputs to either of the two outputs. States are selected by 4 positive voltage control inputs. The switch can operate over the temperature range of -40 °C to 85 °C. The SKY65006 is a linear high gain, medium power amplifier designed for low voltage operation. This device is manufactured on our advanced InGap HBT process. It is designed for power amplifier applications in WLAN and spread spectrum use from 2.4–2.5 GHz. 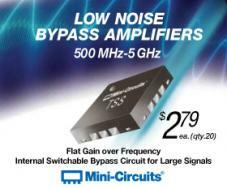 The amplifier is packaged in a QFN 3 x 3 mm package.